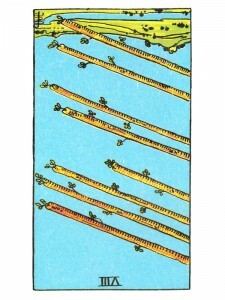 Eight of Wands (R) shares that you tend to get carried away with new ideas – try not to loose sight of your perspective or your self-confidence now. Take any sudden infatuations or new ideas in stride and control your emotions. Your own apprehension can create insecure feelings and cause you to procrastinate. Act swiftly and communicate directly. Jealousy arises from uncertainty and confusion – in both your own feelings and the feelings of others. Quarreling solves nothing and any force or pressure could ruin all your plans. When things are not “working for you” – take the time to reevaluate your situation. Know and trust that a slight adjustment can and will change everything. Here are the problems of extremes – a major temptation is to move too fast. To try is like letting a rubberband be drawn tighter as the lead end move on – eventually the tail end must be let loose and will spring forward to join the lead end in one great snap to make up for the lost time. The backlash can hurt. A new direction for growth? Next to Sun: Good vibrations are present, you can anticipate a pleasant gathering – emit your charm. Next to Lovers: Promises will be given now – your future is being discussed. Warm, genuine conversations taking place. In the first position: Even though you may never leave home, the life of the spiritual gypsy will take your soul where it needs to go – keep your spiritual bags packed. Being a messenger is not easy; remember that he is the one who frequently catches the worst of it. In the second position: You have tried to make your surroundings and personal habits relaxed and natural, yet organized and working. To date – you have been unable to operate as efficiently, as responsively as you would like. In the third position: What you hear may be more for others than for yourself. In the fourth position: The depth of feeling here may be compassionate yet private, shying away from physical contact, preferring to look inward. In the fifth position: You are not pleased with the intensity that is imposing itself on you. You may question the validity of the information and/or the sources you have been receiving. At a very distorted extreme, you may be aware that you are passing poor information. In the sixth position: Slow things down a little bit. This will give time for the sincere yet slower members of your group to catch up. Also this will give those less sincere the opportunity to lose patience and drop out of their own accord. In the seventh position: This is a wave of doubt to make you reconsider and rework mental projects that are not yet up to your full potential. In the eighth position: Awareness seems to be outpacing action. Your foundation may be too heavy and unable to respond. In the ninth position: Your heart may struggle with giving, or accepting, credit where it is due. In the tenth position: The mobile organization that will support your goals may require considerable reorganization. It will be easier than it looks.